In the 1980's, CTV used to run a television program called "Thrill of a Lifetime". Viewers would mail in their once-in-a-lifetime dream, and whichever ones were picked by the producers would be made a reality. Thus, every episode would feature a lucky contestant living out their ambition of rock-climbing or recording a song. In the summer of 1987, when I was devouring Elwy Yost's programs "Saturday Night at the Movies"and "Magic Shadows", as well as his book Magic Moments From The Movies, I had seriously considered writing in, in the hopes that they will fulfill my modest ambition of simply sitting down and spending a day with Mr. Yost and chatting about movies. No, this lofty request was never mailed. However, this would-be "thrill of a lifetime" did occur in the fall of 1989, during my first year in the big city, at school, away from home. One Thursday night, after seeing a double bill of Night of the Living Dead and Murnau's Nosferatu at the Nostalgic Cinema, while standing on the platform at Kingsway Station waiting for the subway to take me back to my university residence, who should walk by but Elwy Yost and his wife Lila! "Elwy Yost sightings" were hardly rare in Toronto, however this one was all the more precious because he had just entered semi-retirement, and had moved to Vancouver. He and I exchanged glances as they walked by, and after my first reaction of wonder that my idol was within my proximity, my second reaction was of how tall he was. Because of his round face and that we mostly saw him on television in a seated position, his onscreen presence deceived me into thinking he was perhaps a head shorter. Although the Yosts and I had entered the same car on the subway train, at first, I wasn't going to say anything to him, because I have never been (then as now), a celebrity hound (or as they say in my biz, "a star f***er"). But this was Elwy Yost, man! This was the single driving force more than any other who influenced my love for cinema, which I was studying in the big city no less- how could I not? Thus, I humbly went up and asked him if he was Elwy Yost. He said, "No I'm not-- I get asked that a lot", then said he was only kidding. So, for the next thirteen subway stops, I had the above "thrill of a lifetime" of talking to the legend about cinema. I should add at this point that while Elwy was-is obviously a beloved icon in this province, never once in the conversation was there the impression of "celebrity and spouse"-- his charming wife Lila was-is just as much of a cinema lover as her husband, and was equally involved in the conversation. They were a team-- acting as each other's rock. I mentioned that I had seen Nosferatu at the Nostalgic, (by the way, this was a film I had wanted to see for years-- a lot of long held ambitions were being fulfilled on this night!) and that I was disappointed, and he concurred that when he had seen it, "I didn't know what to think of it either-- when I saw the monster in it, I didn't know whether to be scared or laugh." (Okay- we have on record at least one film the always ebullient Mr. Yost didn't like). This in turn got us on the subject of Murnau, in which we discussed The Last Laugh (he hadn't seen it!) and Sunrise, which was upcoming in the Nostalgic's schedule, and was highly recommended by both of the Yosts. Throughout this delightful twenty minutes, other movies were discussed, such as The Killing, which was on his show the coming weekend, but the pinnacle of the conversation was perhaps when Mr. Yost said how surprised he was at the number of films I had seen. 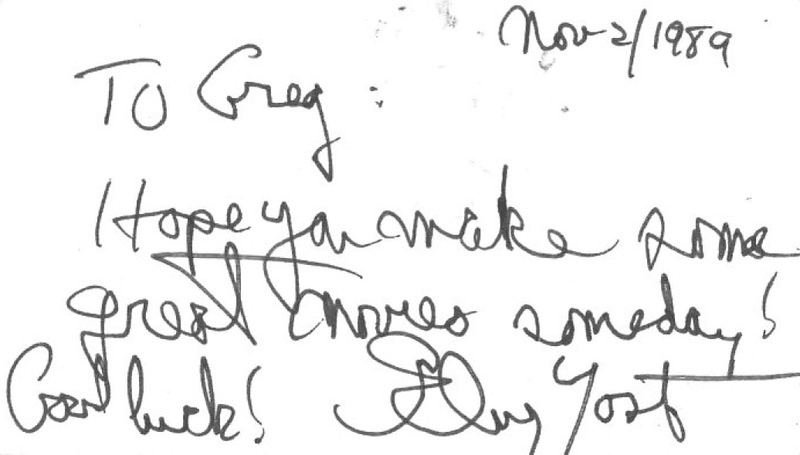 St. George Station was on the approach and before the dream ended, and I asked for his autograph. "You're a living legend to me," I said. "You're very kind," he replied. 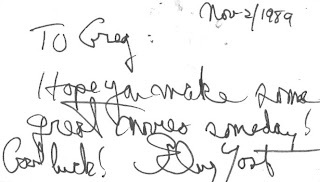 He signed the back of a little card that the Nostalgic had made to plug an upcoming program of science fiction films. As I shook hands of both the Yosts and made my way to the subway doors, I thanked him for showing the restored version of Gunga Din. While subway whizzed by me, both Yosts gave the "Elwy wave" out the window. What a class act. I switched onto the northbound train to campus, with tears in my eyes, joyous at having met one of my personal heroes, and also elated upon the discovery that he was as exciting, charming and down-to-earth on or offscreen. Over the years, I've met with and interviewed other celebrities, but this was the brush with stardom I shall always cherish. "Thrill of a Lifetime" indeed. This post is assuredly not unique, as many movie fans in Southern Ontario can attribute their love of cinema in some way to Elwy Yost, the affable host of TVOntario's "Saturday Night At The Movies". This program not only nurtured that passion, but also showed the rich diversity of film history. 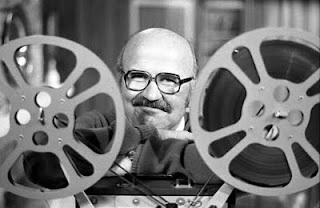 From 1974 to 1999, Mr. Yost gave viewers the best date in town (even giving CBC's "Hockey Night in Canada" a run for its money in the ratings), presenting a double bill of films from the Golden Age of Hollywood, (which were paired for similar themes or genre studies, or simply because they shared the same star, writer, or director). After each of the two films he would present his own interviews with a veritable "who's who" of Movieland, taken from his mighty archive that grew with each annual pilgrimage to Hollywood. This weekly program took one increasingly deeper into the magic of the movies, with a substance far exceeding most of the celebrity-obsessed pap that passes itself off as entertainment journalism these days. It wasn't enough that generations young and old would know such luminaries as Bette Davis or Henry Fonda. One came away learning about Preston Sturges, Franklin Pangborn, Nunnally Johnson, Powell & Pressburger, to name only a few. Over the years, one would also go behind the scenes to learn about how the bullet holes were made for The Wild Bunch, or the stop motion animation effects of 1960's The Lost World. "Saturday Night At The Movies" however would still not be as high-caliber a program were it not for its host. 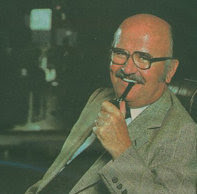 Elwy Yost possessed an "everyman" quality: with his moustache, glasses and pipe (in the older shows), he could be our neighbour or a relative. With his warm demeanour, gift for storytelling (reminding us how much learning is fun), and his trademark enthusiasm, however, he became a surrogate friend to countless people. 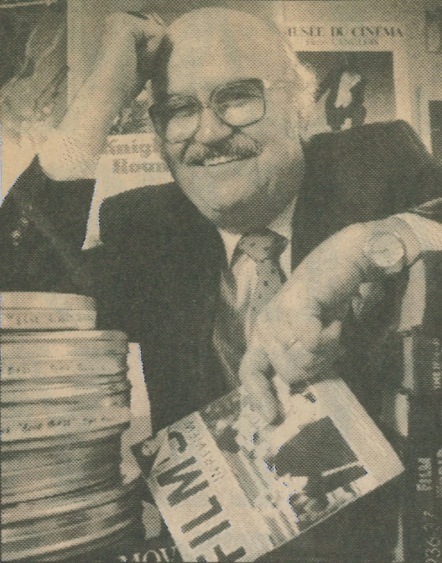 Despite how learned he was, Elwy still nonetheless appeared as a film fan more than a scholar, and his joy was always felt in his introductions and interviews. Through him, one realized that all cinema mattered: whether he showed Ingmar Bergman or a Dorothy Lamour sarong picture, one learned how each feature that ran through TVO's projectors was in some way part of the history of cinema. 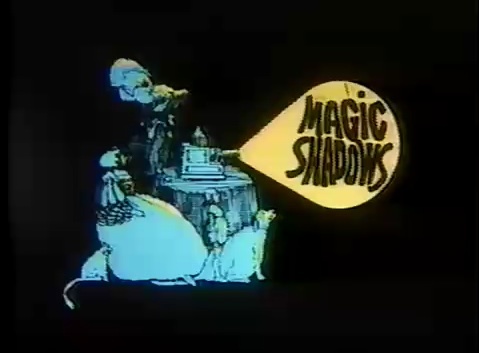 My first encounter with Elwy Yost was during my public school years, upon discovering his sister show, "Magic Shadows", which ran from 1974 to the late 1980s. Every weeknight at 7:30 PM, he would serialize a feature film in half-hour installments. And since the film would likely not be long enough to fill all five nights, the duration of the week would be filled with ongoing chapters from a classic matinee movie serial. Thus, The Adventures of Captain Marvel could take several months to see, as one would wait for it to air in the available time slots. Over the years I had seen The Yellow Balloon, Son of Kong, Belle Starr, My Darling Clementine, The Cat People, A Night in Casablanca, as well as the great serial The Crimson Ghost in this fragmented presentation. Such a program is lost in today's "on-demand" environment, as in those pre-VCR days, "Magic Shadows" necessitated one to be home every night at 7:30 to catch all the parts of the movie. But like "Saturday Night....", "Magic Shadows" also made for fun viewing for its host and the guests. The set for "Magic Shadows" consisted of a homey-looking backroom, which could have been in your house or mine (all that was missing was a fireplace and a dog sleeping in front of it). The pipe-smoking host would welcome the viewer, and after his typically enthusiatic and knowledgeable introduction, the camera would slowly zoom in as Elwy turned on the film projector next to him, move further into the light emanating from the lens, rack focus, and we were in the land of movies. And perhaps because the time slot for the program appealed more to youngsters, the guests on this show were more there for fun than historical posterity- which is why he was visited by someone dressed as Captain America. One of my earliest memories of the show was in early 1978 where he showed Charlie Chaplin's The Adventurer while a bunch of kids sat around his easy chair. (I believe they also referred to him as "Uncle Elwy"). During the Halloween 1984 broadcast of The Cat People, he even had trick-or-treaters appear at his door! When he showed a Laurel and Hardy movie, a member of the "Sons of the Desert" fan club stopped by. "Magic Shadows" bewitched many a young viewer during its reign, leaving an impression with its trippy animation evocative of Yellow Submarine, and memorable theme song (a fond personal memory was in finding a university classmate ten years later with whom I could sing it). As I grew older, and stayed up later (or, more to the point, when I became old enough to no longer need a babysitter who wanted to watch "Love Boat"), I eventually discovered "Saturday Night at the Movies". 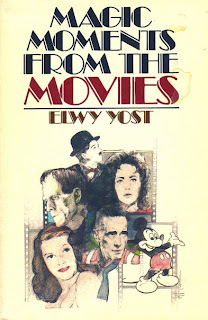 During the 1980s, as my interest in cinema increased, Elwy Yost was my surrogate teacher. I was among countless viewers who would look forward to learning something new about film history every week while being entertained. In smaller towns and cities during those days, one didn't have the internet, nor a well-stocked library or store on books of the cinema- Elwy Yost was a veritable institution, upon whom film enthusiasts could hungrily rely for information and entertainment. 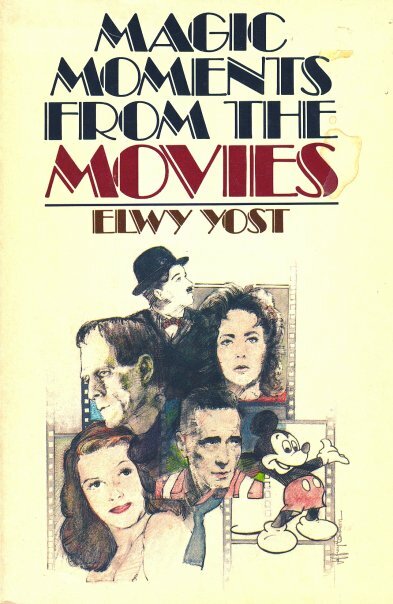 Although he had also published a few novels, Elwy Yost only wrote one book about cinema. Magic Moments of the Movies was a nostalgic work in which he would describe his favourite moments of cinema- through his prose one could vicariously relive the movie, and for that matter, his diction in print matched that onscreen- this lovely little tome was a "portable Elwy Yost" that one could enjoy between the Saturday night viewings. During the summers of 1984 and 1987, I borrowed this book from the library incessantly. In between the lines of his reminisces, one also learned about the times in which his chosen films of affection were made, and the craftspeople who made them. In 1989, Mr. Yost had scaled down his workload, and attempted to semi-retire to Vancouver, in his wife's home province, only presenting one film every Saturday night. The time slot for the second film would be filled with an installment of Jay Scott's "Film International". However, in short order, he was back introducing a double bill of cinema for several more years, before finally taking his last bow in 1999, and spending his remaining years in British Columbia. Elwy's final episode of "Saturday Night in the Movies" was an emotional affair in which he and his trusty producer Risa Shuman shared memories and clips from his 25-year legacy, and then presented the 1994 film, Speed, which was written by his son, Graham. Yes, that is a film projector. "Saturday Night at the Movies" continued the following season with Shelagh Rogers, whom I believe was handpicked by Elwy Yost, and did a superb job filling his shoes, until her complications with CBC forced her to leave the show. The program continues, and even after a revolving door of hosts (and also several years without one)- it sadly has become the antithesis of everything Elwy had built it up to be. Regrettably, the program has become cold, impersonal and pedantic. The warmth and enthusiam has been replaced by title cards and soundbytes. In our current age, we must contend with hipster film critics that can only speak of cinema with a detached pseudo-intellectual post-modern irony, and so-called entertainment journalism that is as light and disposable as a plastic razor. There was none of this with Mr. Saturday Night: like all the giants in broadcasting (most of whom are sadly now gone), Elwy Yost never talked down to his audience, and never shot for the lowest common denominator. He understood the medium of television through which he communicated his love of another visual medium: the cathode ray tube allowed people to communicate with their viewers on an intimate level- he was a scholar, but he acted more like a good friend. But even more than a familiar face that people allowed in their homes, he was a role model who shaped audiences young and old. Elwy Yost indeed left a long shadow in television after his retirement. The intervening years have only further increased the need for someone of his stature to keep alive the history of the cinema. In the next few days, I'll be posting some more memories and archival pieces about Elwy Yost, as well as a page linking to online tributes and articles. His legacy has influenced me on such a personal level, and for that matter, has shaped much of how The Eclectic Screening Room approached film writing, that we can only repay our gratitude for having learned from this man. This past Saturday night, according to the handy online Zap2It listing, WKBW's broadcast of the long-running late-night movie show "Off Beat Cinema" was supposed to be showing Blacula. On Sunday morning, I checked the VCR in the hopes that what indeed aired was that film, as OBC's episode of it likely dated from the late 1990s, when their format was a lot different from now. 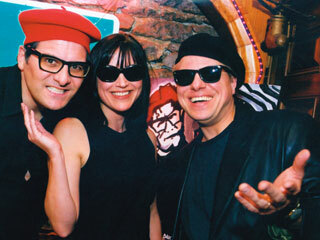 Despite that our friendly beatnik hosts, Maxwell Truth Zelda and Bird, those hepcats from the Hungry Ear Cafe who have been showing us way gone B movies late at night for (gasp!) nearly 20 years now, have pretty much found a comfortable pattern in recent times, it is a treat to be able to sometimes see their shows from the early years, as the format was perhaps more loose and freewheeling than now. 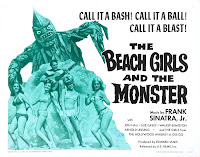 Instead, what I got was the beatniks introducing the 1965 horror flick The Beach Girls and The Monster. This, however, was a joyful surprise. I won't get into a review of the film itself right now (as I'm planning to elaborate more about it in a future project), but suffice to say it is one of the most delightful pieces of drive-in junk that I've viewed in many moons. To paraphrase what Mr. Truth himself said in a telephone interview I conducted with him (for ESR's "Late Night Television" issue way back in 2008), it isn't just about the movie whenever one tunes into their show. The film is just part of the whole package. By all means, one can tune into OBC to watch Attack of the Giant Leeches, but the show also exists on a deeper level. Off Beat Cinema is one of the few existing bastions to carry on that almost folklorish tradition of the late night movie. Although the late late show was a way for TV stations to fill the midnight-to-dawn slot with inexpensive programming (paid for by low-budget commercials) since so few were watching anyway, it however spoke to those people who were displaced from the regular 9 to 5 routine, and for that matter those who were displaced from whatever mainstream pop culture currently feeds everyone else. While the majority of the world slept, these people would seek solace in the retroactive programming of old movies and television shows, which, if they were likely, would also be hosted by someone who was sharing the experience with them at the other end of the transmission. The late late movie would keep the past alive for generations new and old, but this nostalgic look at history also offered a surrogate companionship and shared feeling of community among those who upheld it. However, as we know, in the late 1980s and early 1990s, when independent stations began to merge into faceless conglomerates, programmers decided they could be even cheaper by showing the same infomercials night after night instead. Thus, Off Beat Cinema's birth in 1993 was a welcome relief: correctly touting itself as a revolt against the ads for spray-on hair, one could be reminded every week what it was like in the good old days, as this espresso-drinking trio endeared us fellow nocturnes with their choice programming from yesteryear, enforcing why it was so much fun to stay up late. 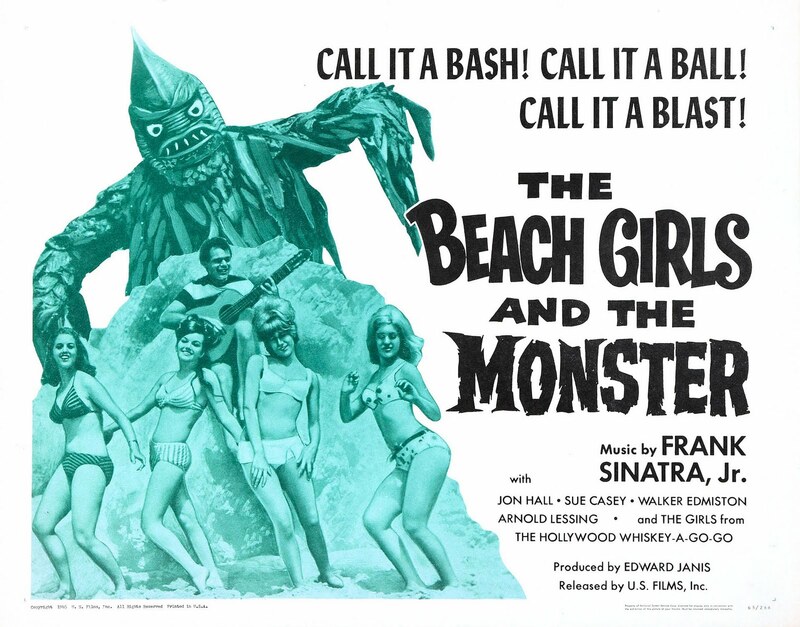 And every so often, OBC produces an episode like the other night's airing of The Beach Girls and the Monster. This instalment (originally produced in 2008) crystallizes everything that one holds dear in the late late movie experience. While the main attraction was a movie which delivered a non-stop parade of fun, the program also featured vintage movie trailers (Flight to Mars; Invaders From Mars), and even an interview with former "Beach Party" movie star Frankie Avalon(!). It was a bang-on, non-stop collection of memories, served by our affable hosts who have now become surrogate friends who preach to the converted. This enjoyable experience also gives one pause to sorrow, as the younger generation, so weened on instant downloads and on-demand programming, has no idea what it was like to stay up in the middle of the night in pre-VCR days. Granted, accessibility to entertainment, new or old, has never been more easy, but in the bargain we've lost the mystery and anticipation of discovery, and in some ways we've lost that sense of community which is a little less artificial than what "social networking" provides. Saturday's rock-solid presentation of "Off Beat Cinema" reminds us once again why such a piece of pop culture is so essential to preserve.